Pics "Battery anxiety" is a mobile phone buzzphrase that has been bandied about for some time – highlighting the trade-off we've made with large touchscreens, multi-core processors and our obsession with using the darn things. 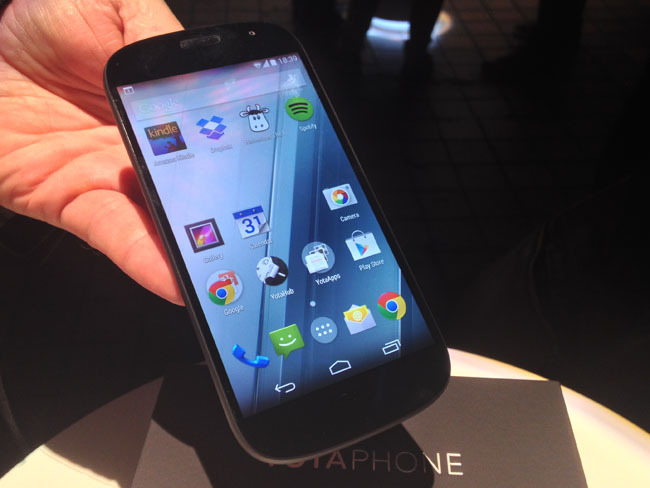 The Yotaphone 2: six-day battery life, anyone? Bigger form factors can slot in a bigger battery, but if devices need to be slimmer too (even if they bend), then there’s only so much you can do to get your mobe to last without er, getting anxious. That’s true up to a point, as there’s only so much you can do with conventional form factors, but Russian company Yota has a different idea first seen at CES back in 2013. 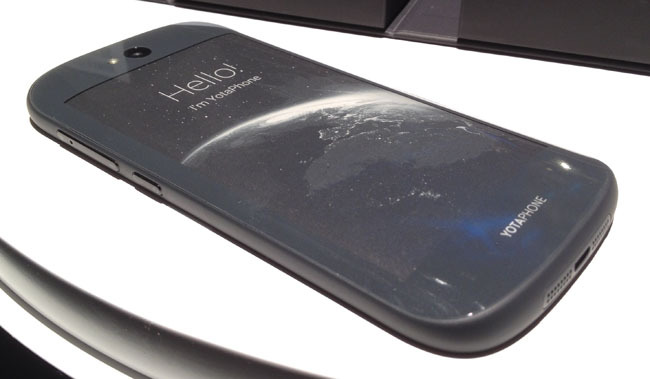 The original YotaPhone eventually surfaced for sale around this time last year and its unique approach was to feature two screens – a conventional full colour touchscreen on one side and an e-ink screen typically found on ebook readers and noted for its low power consumption on the other. The idea is to save power by using the always-on e-ink screen for basic tasks such as reading and checking notifications. 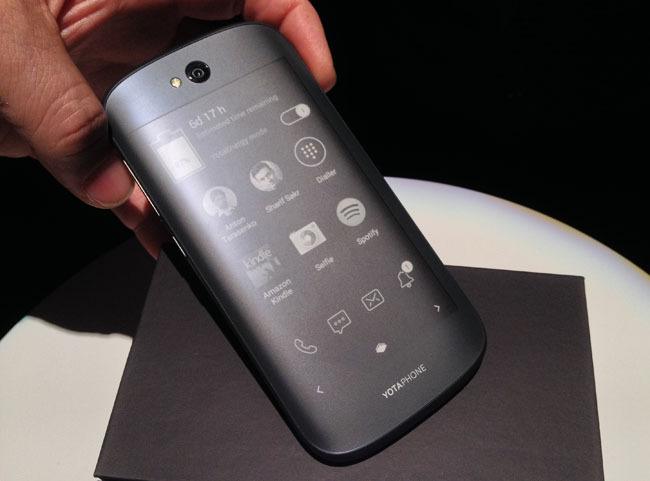 In London yesterday, Yota CEO Vlad Martynov announced the latest rendition of this two-faced phone, the YotaPhone 2, with even better battery life claims and power management. 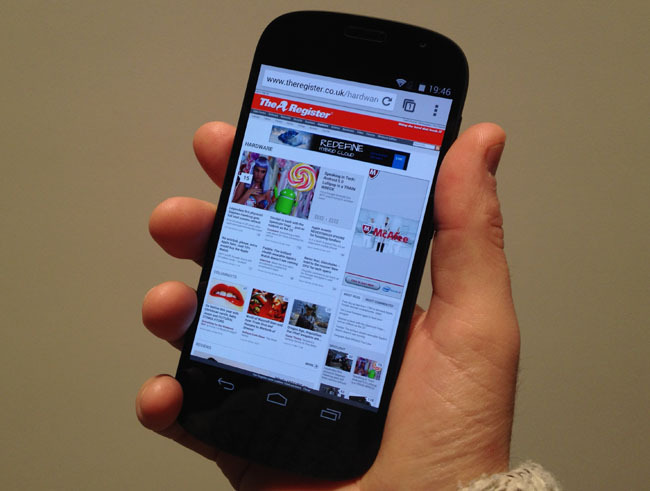 The phone relies on Android 4.4.3. Running the show is a 2.2GHz quad-core Qualcomm MSM8974 PRO-AA processor with 2GB of RAM and 32GB of fixed storage. On the front you get 5-inch 1080p AMOLED touchscreen and on the back a 4.7-inch e-ink touch display. The curved styling of the YotaPhone 2 is worlds apart from the slab-like original – and from the front you could easily mistake it for any number of mainstream Androids. It’s fairly light too at 145g and measuring up at 144 x 69.5 mm x 8.9mm – everyone seems to want to make a phone that’s 9mm or less these days. The casing appears all plastic but both displays feature Gorilla Glass 3, so that should keep cracked screen syndrome at bay – very fashionable among iPhone users, or so it would seem. Testing out the 8Mp camera on the stand produced a crisp image with good colour balance and there’s a flash too, if needed. 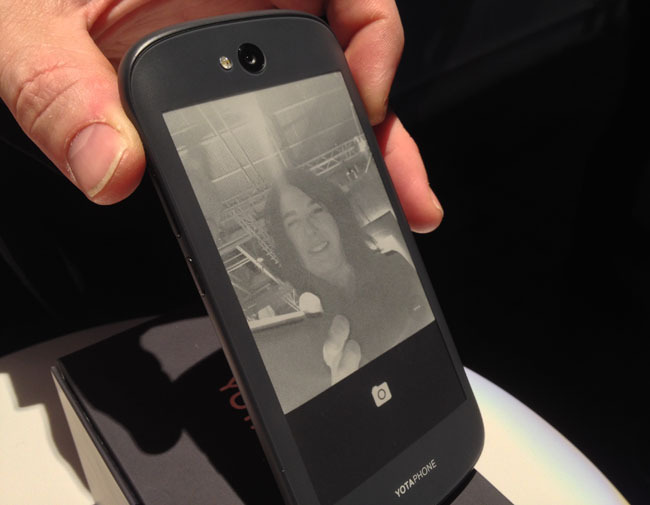 Interestingly the selfie cam on the e-ink side shows you a realtime monochrome view when activated. This screen does a whole lot more though and the you can view different panels of information such as calendar, weather, news feeds and more.